Just ahead of the annual CP+ show in Japan and The Photography Show in Birmingham, UK, Canon has refreshed its most junior DSLR offerings with a pair of new models. The EOS 4000D and EOS 2000D are intended for those taking their first steps into interchangeable-lens photography. While their specs are fairly rudimentary by modern DSLR standards, they are set to provide the cheapest entry point into Canon's exhaustive ecosystem of lenses and accessories. The EOS 2000D, which is the more senior of the two models, combines a new 24.1MP APS-C sensor with Canon's DIGIC 4+ processing engine and Full HD video recording. As we'd expect from a model with its entry-level billing, it incorporates Canon’s Scene Intelligent Auto mode to allow point-and-shoot photography with the automatic optimisation for every image, together with Canon's Feature guide to help explain key settings. The EOS 4000D sticks to much the same idea as the EOS 2000D, although it offers an 18MP sensor in place of the EOS 2000D's 24.1MP sensor, and has a slightly smaller 2.7in LCD screen. Furthermore, it lacks NFC compatibility, although it does maintain Wi-Fi. Both models work with Canon's Camera Connect app (available for iOS and Android), which allows for images to be transmitted wirelessly from camera to smartphone or tablet. Canon also points out that novice photographers may wish to use the additional Canon Photo Companion app, which combines tips and tutorials with challenges. 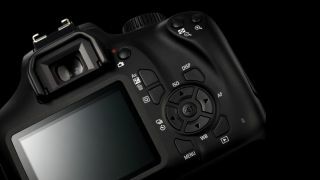 Both cameras will be available from March, although you can already pre-order the EOS 2000D from Canon's online store. The EOS 2000D has a recommended retail price of £369.99 for its body and £429.99 for a kit with the EF-S 18-55mm f/3.5-5.6 IS II lens, and $549.99 for the kit in the US. The EOS 4000D, meanwhile, will retail at £329.99 for its body and £369.99 for a kit with the same lens.